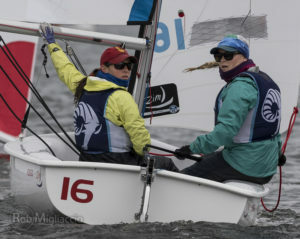 The Lady Rams qualified for the Nationals over the April 22-23 weekend at the Jerry Reed Trophy sailed at Brown. Rachel Bryer and Hannah Scanlon were excellent as usual, finishing fourth in A. Sarah Hermus was really sick all weekend and she and Marisa struggled, but their combined effort was good enough for 6th overall. Sarah and Marisa had their best race of the day in the last race which moved the Lady Rams past Dartmouth. The Women’s competition in NEISA this year has been extraordinary. The coaches feel that NEISA will be sending the deepest and strongest group of teams ever to the Nationals and are unanimous in predicting that NEISA will dominate the podium. Last year’s champions, Coast Guard, won the Jerry Reed and will be tough to beat, but the Lady Rams will be back at full strength and ready to challenge. Rachel and Hannah were honored by being named to the All NEISA Women’s Team again this year. Hannah was named Women’s Crew of the Year for the second straight year and Rachel was again a finalist for Women’s Sailor of the Year.